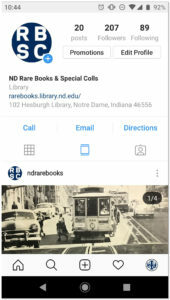 In addition to this blog and our website, Notre Dame’s Rare Books and Special Collections is also on Facebook (https://www.facebook.com/NDrarebooks/) and Instagram (https://www.instagram.com/ndrarebooks/ or @ndrarebooks). 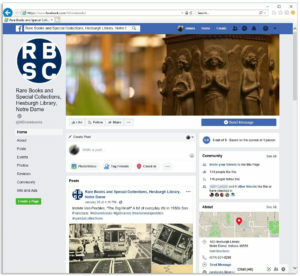 Follow us on either or both social media sites to keep up to date with events, exhibitions, recent acquisitions, and highlighted items from our collections. Feel free to tag us in your photos, too, and help show Special Collections in action!